Jeffrey Gutman, the chair of the Faculty Senate’s professional ethics and academic freedom committee, introduced three resolutions to the faculty code Friday. The Faculty Senate unanimously passed three resolutions Friday updating faculty hiring and promotion procedures in the faculty code, a document that specifies professors’ rights and responsibilities. The first two resolutions differentiate the appointment and reappointment processes for regular and specialized faculty and authorize the provost, instead of the Board of Trustees, to make decisions about reappointments for instructors, the lowest-ranked tenure-track position. The third resolution, which garnered the most debate but ultimately gathered the full support from the senate, prevents candidates for tenure or promotion from filing a grievance because they believe the provost has made an “arbitrary or capricious” decision. Jeffrey Gutman, the chair of the senate’s professional ethics and academic freedom committee, introduced the three resolutions – the last of several proposed changes to the faculty code this year. The resolutions will now be passed on to the board, which will approve or reject the proposed changes at its May meeting. The first resolution specifies the criteria for appointment, reappointment and promotion of specialized faculty candidates for non-tenure track positions. The resolution separates the criteria for specialized and regular faculty. Based on their contracts, specialized faculty are responsible for one or two out of the three categories of teaching, research and service to the University. Regular faculty are responsible for all three. At a senate meeting in February, faculty noted a lack of guidance for determining criteria for specialized faculty seeking appointment, reappointment or promotion to non-tenure-track positions. 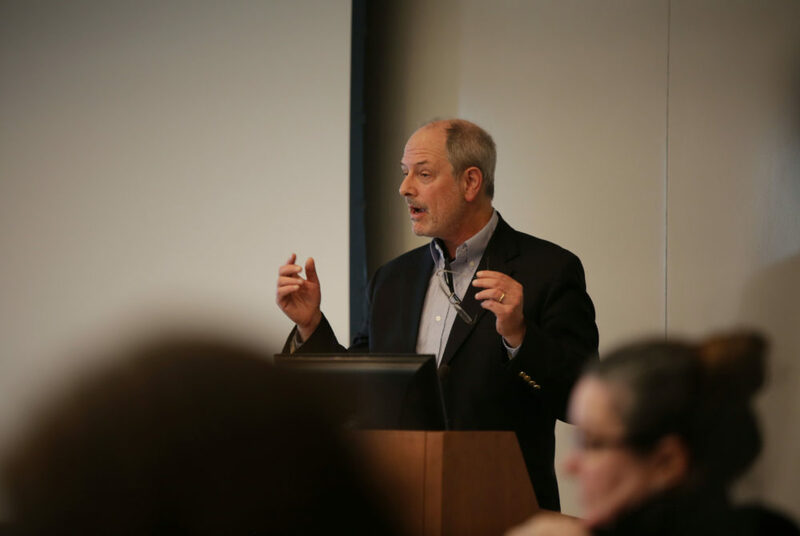 “The faculty code, to date, doesn’t have particular mention of how the specialized faculty are to be evaluated in terms of criteria so we thought it, in conjunction with the provost’s office, important to make specific mention,” Gutman said at the February meeting. The second resolution transfers the authority to reappoint instructors beyond a fourth single-year term from the board to the provost. Maltzman said transferring authority from the board to the provost could speed up the process to reappoint an instructor beyond four years. He added that an instructor has not been reappointed for a fifth year as an instructor since 2011. The third resolution alters the grievance process for candidates for tenure or promotion alleging that the provost made an “arbitrary and capricious” decision to deny them. Under the new system, the candidate’s complaint is transmitted to the executive committee of the senate instead of moving through the grievance process. The committee can request information and will issue a recommendation about the validity of the complaint to the provost, the candidate’s department and the School-Wide Personnel Committee, a University committee that issues recommendations on tenure decisions and promotions. Candidates for tenure or promotion may still file a grievance based on legal acts of discrimination, retaliation for exercising faculty code-protected rights and failure to comply with the code or other University regulations. If the provost maintains the decision to deny the candidate’s application for tenure or promotion, the candidate may write a letter to the president, who will make a final decision. The president may also issue a one-year extension of the probationary period for a candidate applying for tenure. “We’re hopeful that this process will both be more efficient and fairer to the candidate in question and places the duties and responsibilities in deciding these important questions in the entities that I think are best able to do that,” Gutman, the professional ethics and academic freedom chair, said. Lauren Peller, Madeleine Deisen and Zach Schonfeld contributed reporting.